An idea may well start with an invention, but the bulk of the work and creativity is in that idea’s augmentation and refinement. The newer the idea, the coarser the granularity of most analysis, and the more likely people are to say, “oh, that’s just like X” or “that’s been done before,” without any appreciation for how much work and innovation is involved in taking an idea from concept to wide practice. Too often, universities try to contain the results of research in the hope of commercially exploiting the resulting intellectual property. Politicians believe that setting up tech-transfer incubators around universities will bring significant economic gains in the short or mid-term. It could happen. So could winning the lottery. I just wouldn’t count on it. Instead, perhaps we might focus on developing a more balanced approach to innovation—one where at least as much investment and prestige is accorded to those who focus on the process of refinement and augmentation as to those who came up with the initial creation. 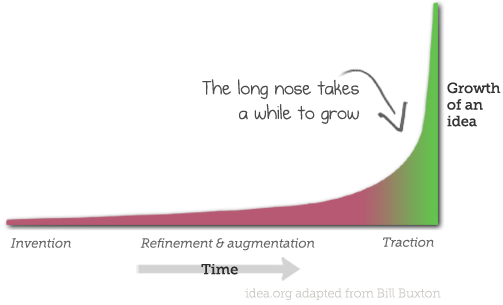 Plan for a long implementation phase. Expect there will be a long process of refinement from the initial idea until it gets a foothold. It’s this refinement and implementation stage which American inventor Thomas Alva Edison meant when he said, “Genius is one per cent inspiration, ninety-nine per cent perspiration” in 1902. Don’t let the turkeys get you down. Ideas which are interesting are easily dismissed by the establishment. 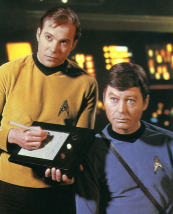 We have seen this phenomenon of a long time from a great initial concept (e.g., tablets in Star Trek in the 1960s) to broad use with the recent explosion of the Apple iPad tablet. The first table from Apple was the Newton in 1991, which took two decades of refinement to become the widely appealing product we see today. For an older, classic example, Buxton talks about the mouse, which started at PARC where he used to work.